The month of July will start in few days and all salaried class employees and self employed individuals have to fill their Income Tax Returns for the Financial Year 2012-13, Assessment Year 2013-14 by 31st July, 2013. Normally this would not have been a problem, you could have filled the Saral for AY 2013-14 and sent it to the local ITO for submission. However this year onwards the Income Tax Department has made e-Filing compulsory for individuals whose Gross Taxable Amount is about 5,00,000.00. For those whose Income is below 5,00,000.00, there is no need to file the returns as be current Income Tax laws. But if you still want to file your returns, you can use the Saral Forms and send them to local ITO as you did last year. I am writing this easy step by step article for those who want to e-File a return using Income Tax login. First and foremost go to here Income Tax e-Filing Website and create a login id and password. There is a green button saying Register Yourself on the Right hand side of the Website, click on it and get yourself registered. Give your current active email id for registration details and the password should be one capital, one alpha numeric and 8 characters or more. Optimal password would be Aaaa@12345 (replace with the words of your choice). Another thing to remember is the 'Secret Answer', this one will help you recreate your password if you have forgotten it (it really helps because most of us tend including me forget the password as Income Tax filing comes once a year). Now if you have done the above correctly proceed. Before proceeding, another word of caution, use a PC with genuine Winsows OS on it. Pirated version is known to give problems while validating the xml file. You will need to keep your PAN number and Form 16 at hand while e-Filing the return so be sure they are nearby. Now open the Income Tax e-Filing Website and download ITR1 and save it to a location preferably on your C drive. The downloads are below the Register yourself button on the right hand side. The file is zip one which you can extract there itself. 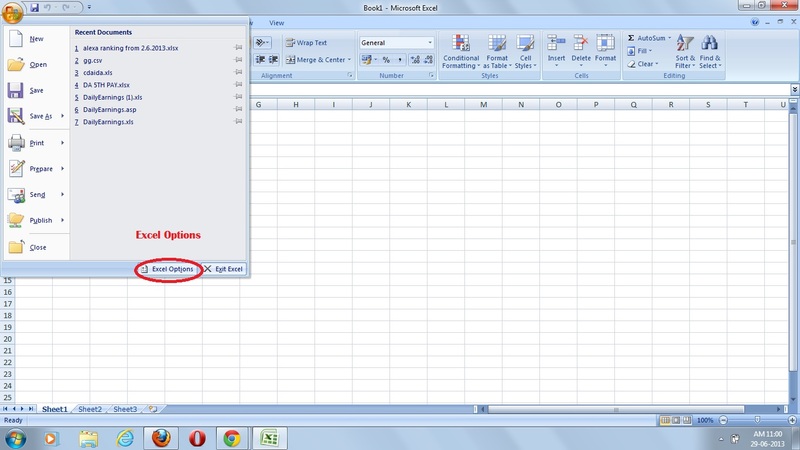 Click on the Excel Options button and go to the 8th button saying Trust Centre and open it. Once you open Trust Centre, go to Trust Centre Setting at the right hand down corner. Open the settings and go to 4th button called ActiveX settings and enable all the ActiveX controls (4th button). Go back to Trust Centre Setting and click on Macro Settings (5th button), here too, enable all Macros (4th button). Say ok and close the Excel Window. 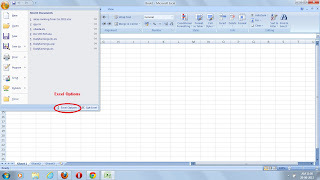 Now go the file which you had extracted earlier (named 2013_ITR1_PR6.xls), double click on it and the Excel Workbook will open with 4 sheets in it namely Income Details, TDS, Taxes Paid and Verification and 80G. Go to the Sheets one by one and fill the details. In the Income Details sheet, enter all relevant data correctly like PAN No, your Mobile No. (do not give the STD code, the sheet then gives error), Date of birth in DD/MM/YYYY format, Employee Category, Income Tax Ward/Circle (Mumbai is 11(1)), say no to are you governed by Portuguese Civil law (I dont know what that means), Residential Status etc. Once you have filled in all the details press Validate at the top right, if you have correctly filled in correctly the file will validate. If not it will give a error message. Read the error message, its in some kind of foreign language but you can understand the gist of it. Go to the column it wants correction and correct it. Once validated you can print the xls file to be on safer side and for help next year and press Generate Xml button. A xml file will be saved to the same location where you had save the zip file. Now go back to Income Tax e-Filing website and log in. Go to upload xml button and upload the file. You will receive a message saying that your file has been uploaded and download the ITRV file(you will receive the same in your mail also). You have to download this file, take a printout and send it to the following address. The ITRV is password protected. Your ITR-V/ Acknowledgment is protected by a password for your security. Please enter your PAN (in small letters) and Date of Birth or Incorporation (in ddmmyyyy format), in combination, to view your ITR-V/Acknowledgment. If your pan is AAAPA0000A and the date of birth is 10-Jan-2008, then the password will be aaapa0000a10012008. Remember to send it by Speed Post/Ordinary Post only Courier is not allowed. If you have any problems with the above kindly comment on it and I will try to solve your problem. If you have successfully filed your e-Return with my tutorial, kindly post in your comments also. Good one... the deadline is approaching and I am sure it will help many like me. When i enter my PAN nos and other details for registration it says already registered. when i hit the forgot password peice it yet doesnt allow me to go ahead. I have never hit this site ever to even register. kindly advise or suggest. Ritesh Are you sure? If so there is a toll free number which comes up when you get the message that says its already registered contact the number and tell them the problem. Phone in at around 11.00 am in day time you will get a response. Your guide is indeed very clear and is helpful even to a layman! I appreciate. I do not have MS Word and Excel on my comp. I do use OpenOffice.org 3.4.1. Though I do not have Taxable Inacome, I have been filing paper returns for quite some time now. I need to file ITR-2 as there is some LTCG loss to be carried forward. Will you please guide me. Thanks, Vijay, for the wonderful Tutorial and further guidance by way of update. I have two issues: A. I wanted to use form ITR-2 as I have been always using that since I do have some CG arising out of share transactions. But ITR2 is not available in the drop down. However, I do not have taxable income till now, including in FY 2012-13.. Last year I had some losses under LTCG, which was shown as carried fwd. This year (FY 2012-13) I have profit as well as loss. Net is a loss. I wanted to show this with a view to take future benefit in case I increase my share activity in the coming years. What can be done for this? For FY 12-13's LTCG profit, tax is not applicable. Therefore, in case I carry fwd, do I have to c/f net figure or only the loss figure? B. In the Exempt Income column i.e.D20, it takes only 4 digits. I do have a 5 digit figure. How to overcome this difficulty? GK Sorry I was a little late in replying this. As per my knowledge you have to carryforward only the loss figure in case of LTCG. Are the steps for ITR 5 same as for ITR1???? hi i would like to know once you have paid you tax practitioner for sole proprietor fees do you have to pay again :-? Hi I would like to know what are the company details required to be specified for filing return as a partner in a firm. Also is it required for doing any initial procedures from the company end before filing the return of any partner of the firm. Also will there be any fine if the net tax is nil and is filed after the deadline.